Istvan Horvath – Transylvanian Hungarian journalist, theatre critic, translator, author, blogger (originally known as Horváth Sz. István in his homeland). At the end of the last century Istvan moved to Canada, where first he studied cross-cultural communication and applied linguistics, then became a freelance interpreter and translator. In 2004 he started his own web design and internet publishing and marketing business. During his years in Canada Istvan published only online; he is considered one of the pioneers of blogging in Hungarian language (2002). 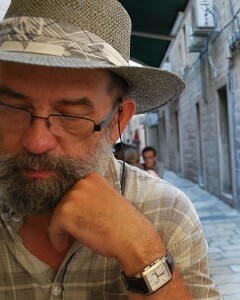 Istvan blogs in English and in Hungarian as well. He published a few ebooks and tutorials related to the WordPress blog engine. In the past several years travel and photography became an important part of his life. Before coming to the brave New World he served as a humanitarian aid worker, representing Hungarian Interchurch Aid in missions by ACT in Chechnya and, before that, in Bosnia & Herzegovina. The most interesting and very formative period of his adult life. When he started to work in Bosnia, he left behind in Budapest a boring sales manager position, which he took up almost as a protest (and to prevent starving, of course) when political games in newspaper-ownership ended his beloved journalist and columnist career. Since the early university years in Transylvania Istvan dreamed to become a journalist… however, the regime considered him not trustworthy: he was allowed to publish but not to be part of any newspaper staff. Prior to emigrating to Hungary he worked as a technical translator in his hometown, providing Romanian translations of outdated Russian industrial equipment; in his spare time he also translated into Hungarian a novel by Vladimir Nabokov – The Defence. Istvan (István, by Hungarian spelling) was born in 1951 in Transylvania (Romania) in the city of Cluj (today: Cluj-Napoca) or Kolozsvár or Klausenburg – the place has different names in the different languages of its inhabitants.